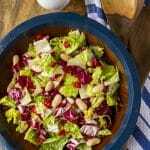 This easy Italian chopped salad recipe features just 4 ingredients: romaine lettuce, radicchio, cannellini beans, and sun-dried tomatoes. 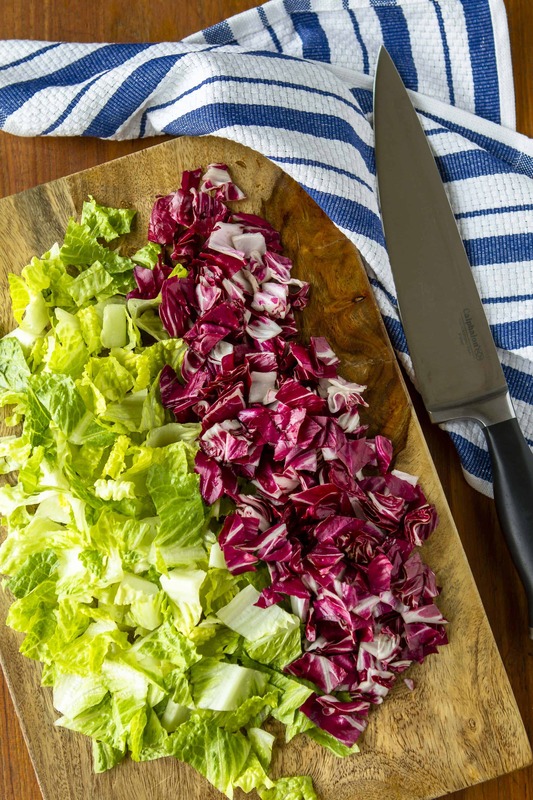 Dressed with a simple red wine vinaigrette, it’s a tasty quick weeknight side dish! Vegetarian & vegan. This is a sponsored conversation on behalf of On-Cor; all opinions and text are my own. Thank you for supporting the brands that support this site! Only problem? Finding a few hours (let alone the few days I really need) to dig in and deep clean is just not going to fit into our busy schedule currently. Between softball, soccer, and weightlifting for football, our calendar is packed to the max. So this year, I’ve decided to try a new tactic — mini spring cleaning sessions each night while dinner is being prepped! And so far it’s working very well for us, especially since we’ve done a pretty fair job of sticking with our “kitchen standards” since January. A recent example: We started by popping a couple of On-Cor Penne Pasta & Meatballs with Tomato Sauce frozen entrées in the oven. My boys are ALL about the hearty meatballs (made with chicken, pork and beef), and my girls adore the freshly made pasta — all topped with a classic Italian tomato sauce. 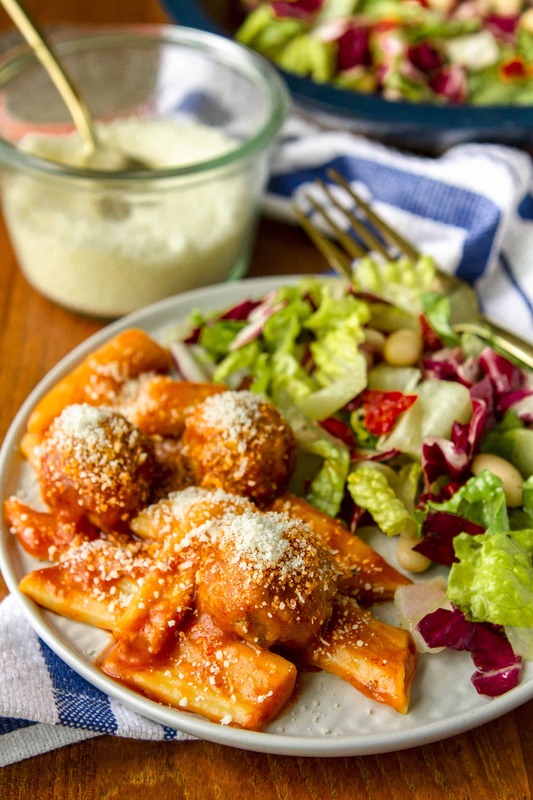 These quality, multi-serve entrées make for an easy weeknight meal that’s always well received! 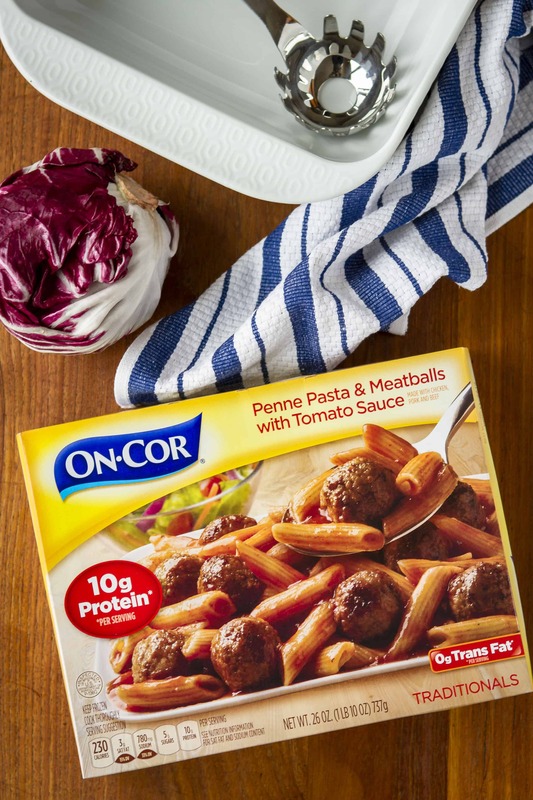 On-Cor has been bringing families together for dinner for more than 70 years, and they just recently enhanced their products and packaging. Now it’s easier than ever to understand the nutrition and ingredients in each entrée. The On-Cor Penne Pasta & Meatballs with Tomato Sauce, in particular, features 25% more meat per serving for a total of 10 grams of protein, and all entrées have no monosodium glutamate (MSG) added. The upside of having five kids (okay, one of the upsides) is that I can divvy up age appropriate tasks between them, allowing us to blow through projects like this in no time at all. So while I started whisking together a simple red wine vinaigrette for the chopped salad, I was able to also manage the refrigerator cleaning process and keep things under control. My youngest boy was responsible for emptying the fridge of its contents and tossing anything that was past its prime or had expired. Then my girls wiped down the fridge inside and outside, while my oldest boys removed the drawers and washed them out. Added bonus of doing it this way — they knew we had a hard deadline for when the work needed to be finished, so they didn’t take their time or argue (much). Since the contents of the fridge were on the kitchen table, we couldn’t eat dinner until everything was put away! Back to this yummy Italian chopped salad recipe… Dressed in a simple, yet flavorful, red wine vinaigrette, it’s the perfect complement to this penne pasta! 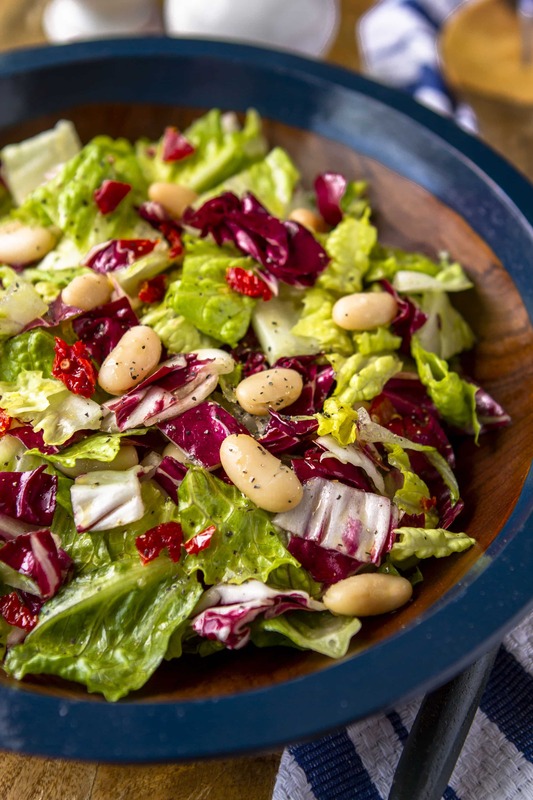 The variety of textures makes it unexpected and interesting — crunchy from the romaine lettuce and radicchio, creamy from the cannellini beans, and a bit chewy from the sun-dried tomatoes. This is one of my go-to quick and easy sides year round! And it also makes a healthy & light main course salad with a larger serving. PIN IT NOW! CLICK HERE TO ADD THIS CHOPPED ITALIAN SALAD RECIPE TO YOUR SALADS BOARD ON PINTEREST! Whisk the vinegar, garlic, 1/4 teaspoon of salt, and 1/8 teaspoon of pepper in a large bowl. Gradually whisk in the oil to emulsify. 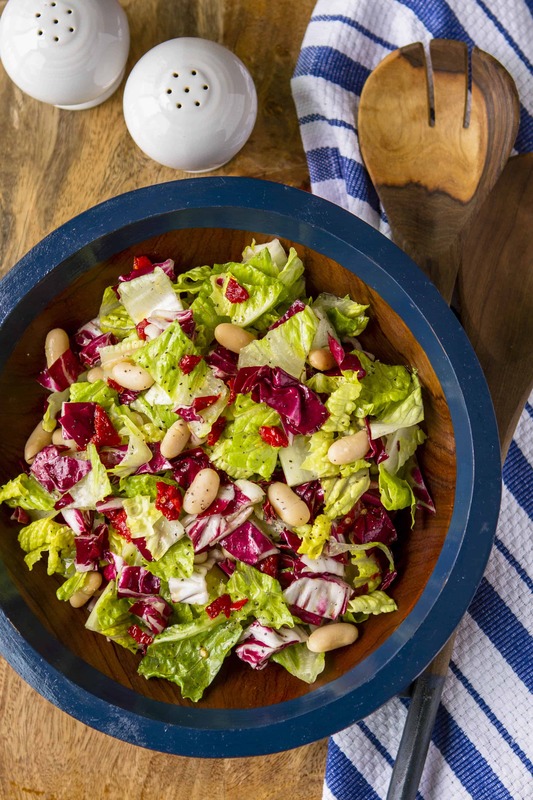 Add the chopped romaine and radicchio, beans, and sun-dried tomatoes, and toss to coat. Season the salad with additional salt and pepper to taste. P.S. If you have a smidge more time, I highly recommend also making this easy homemade garlic bread. It bakes at 375 degrees (just like the On-Cor Penne Pasta & Meatballs with Tomato Sauce), so you can time them to be done cooking at the same time! Life’s demanding enough; your dinner shouldn’t be. On-Cor does the prep work, so you can take care of other to-do’s that need to-doing. For your next family meal, head to the freezer aisle of Meijer or check out the store locator at www.on-cor.com to pick up one of On-Cor’s entrées! I would probably clean the glass windows on the back porch. While my entree is in the oven I will be going over items in the closet to see which can be tossed, donated and kept for another season… and hopefully work on getting some organization done as well under the kitchen sink! My spring cleaning task I need to tackle is the mudroom but I can’t do anything until it decides to stop snowing around here. I’l tackle the play room next. it needs the most work. I would probably clean the kitchen windows. Its my favorite part of spring cleaning so I can see the bright sunshine. i would clean out the fridge while on cor is in the oven. There are any number of things but I need to clean out several closets. I can dust my blinds and make the beds.